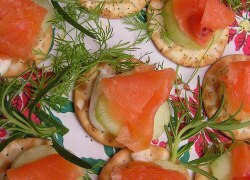 Create these simple but oh so tasty canapé recipes in a jif! A handy piece of equipment to use is a 2-inch pastry cutter. 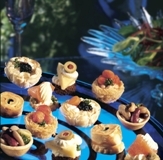 Use a round, triangular or fluted cutter to make pretty cut-outs for any of the canapé bases. Here are some simple and poplar ways to create a delectable base for homemade or store-bought appetizer toppings. Preheat oven to 350ºF. Place baguette slices on a baking sheet . Brush with olive oil. Bake until crisp and lightly golden, about 10 minutes. Preheat oven to 300ºF. Place cut rounds on a baking sheet . Bake until crisp, about 15-20 minutes. Variation: Do not bake the bread slices. Use fresh, fine-textured breads to form a stable base for cheeses, meats and firm-textured spreads. Preheat oven to 400F. Brush tortillas on one side with the oil. Cut each tortilla into 8 even-sized wedges with kitchen scissors or a serrated knife. Arrange oiled side up in a single layer on a greased baking sheet. Sprinkle with salt. Bake until crisp, 5-7 minutes. Cool on a wire rack to retain crispness. Tortilla chips can be made up 3 days in advance. Store in airtight container at room temperature. non-metallic bowl. Add chicken and toss to coat well. Cover and refrigerate for at least 1 hour. Place herbs, garlic, mustard, capers, anchovies, and oil in a food processor or blender. Pulse to a thick paste. Add salt and pepper to taste. Cut steak fillet into about 20 rounds, using a sharp pastry cutter. Preheat grill pan or other pan to high heat. Sear steak round, about 3 minutes per side. Sprinkle with salt and pepper. Cut each scallop in half. Preheat grill pan or skillet over high heat. Use oil if needed. Sear scallops, until slightly charred. Remove from pan. Toss with chili sauce and sprinkle with salt and pepper. Place 1 scallop half on each bread or base. Top with creme fraiche or sour cream. Serve at room temperature. Cut cucumber into 20 1/4-inch thick slices. Place slices on paper towels to drain and dry. Season lightly with salt. Heat oil in a saucepan. Add onion, garlic and sage and cook over low heat until soft, about 5 minutes. Add beans, water and salt and pepper to taste. Cook for about 10 minutes. Mash the beans with a spoon to make a rough puree. Heat a medium non-stick skillet over medium high heat. Add corn, red and chili peppers and onion. Cook, stirring frequently until vegetables are slightly softened and charred in spots. Remove to a small bowl and combine with the cilantro, juice, oil and salt and pepper to taste. Mix well. Cover and chill for 1 hour to blend flavors. Top toasted tortilla chips with salsa. Serve at room temperature. Prepare salsa, without cilantro, lime juice and salt and pepper, 1 day in advance. Cover well and refrigerate. Add these ingredients up to 1 hour before serving. Heat oil in heavy large skillet over medium-low heat. Add onions, garlic, bay leaf and thyme; stir to blend. Cover and cook until onions are very tender, stirring occasionally, about 45 minutes. Uncover and sauté until most liquid evaporates and onions are golden, about 10 minutes longer. Stir in capers. Season mixture with salt and pepper. Discard bay leaf and cool completely. Arrange onion mixture on bread/crust of choice. Decoratively arrange olives and anchovies atop filling. Bake as directed below. Transfer to platter and serve. Filling can be prepared 1 day ahead; cover and chill. 20 minutes until soft and lightly browned, stirring occasionally. Cool. Preheat oven to 425 degrees. Unroll pizza dough. Cut in half. Shape each half in 8-inch circle on ungreased cookie sheet. Top each with half the onions, mozzarella and parmesan cheese. Sprinkle with toppings if using. 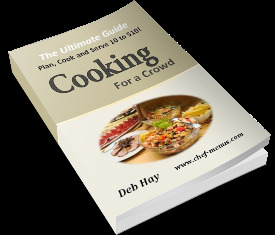 Bake in preheated oven about 15 minutes or until crust begins to brown lightly and cheese is melted. Cut each pizza in 8 wedges. Serve warm. Refrigerate and cover cooked onions up to 2 days. Let onion come to room temperature before proceeding with recipe.